This newsletter is a little later in the year than usual so it covers several events at which the Association has been represented. At the start of the year members of the Association attended the Back to the Regiment. It was encouraging to see the increase in attendance at the function. A highlight of the night was the address by the new Commanding Officer Lieutenant Colonel Jenny Cotton. John Greenwood presented a magnificent photograph to the Regiment showing the honour guard for Her Majesty the Queen during his time in the Army Reserve. John entertained all with his usual wit. The Association again thanks the CO and members for their excellent support in hosting the function. officers who had recently completed the course at Duntroon. 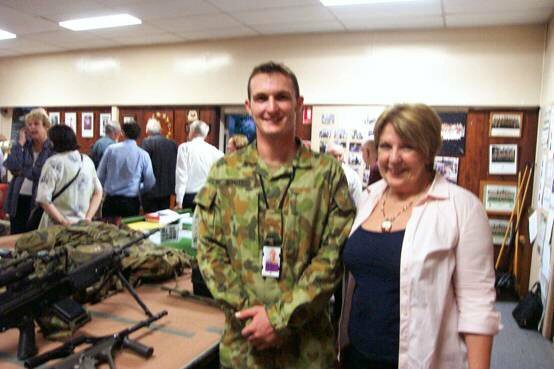 The Association presented prizes for excellence in the art of military skilling. Many members attended the dawn ceremony for ANZAC Day 2007. The number attending was more than in the past. It was great to see the number of young people who came to honour those who have fallen in combat. Although I was not able to attend the Regimental Dinner this year, I understand members of the Association enjoyed the evening. 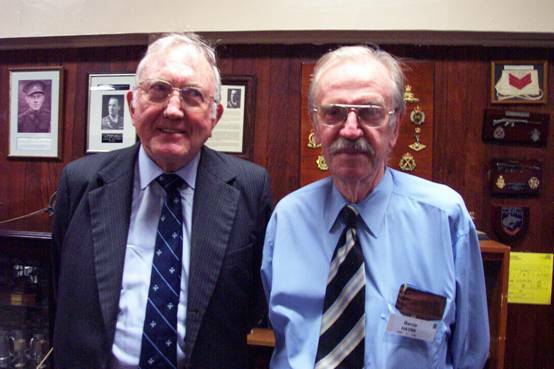 On 14 September 2007 the Annual General Meeting for the Association will be held, as usual, at the United Services Club. The cost for the evening (including 3 course meal and drinks) will be $80. The Association has to finalise the numbers attending by Monday 10 September. As the United Services Club has a policy of no cancellations, the Association will be liable for the costs of the number confirmed. As a result of this, members that have indicated their attendance and then find that they cannot attend after 10th September will be billed for the function as the Association does not have the capacity to underwrite this loss. Please note, this will only apply if the attendance is below the confirmed number. It is requested that members pay when they accept the invitation. We have been advised by the Minister for Tourism, Fair trading, Wine Industry Development and Women of some changes to the Associations Incorporation Act 1981. The changes are effective Friday 15 June 2007 and as such will apply to the Association before the Annual General Meeting. The main change is in that the Association does not have to employ an external auditor to present an audited statement each year. The Association must still publish a financial report at the AGM. However, members still have the power to request that an external audit be conducted. working through the old and new guidelines and will present to all members attending the AGM a list of the required changes. These changes will have to be accepted by the members so that they can be lodged with the government department following the AGM. 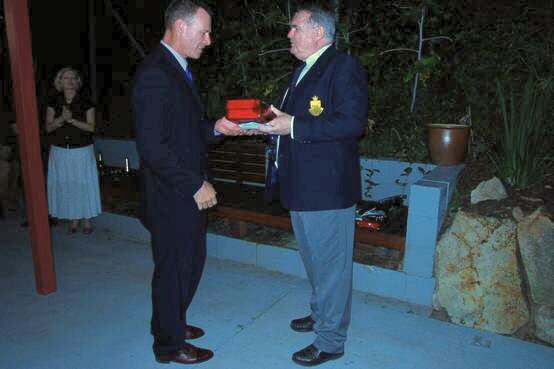 In the recent honours and awards announced, Colonel Peter Sharwood was awarded the Order of Australia Medal. All members of QURA congratulate Peter on this award. consecration was in the ANZAC Memorial Chapel of St Paul, Duntroon on 29 June 2007. Congratulations Len. I remind you of the AGM and dinner on 14 September. It has been getting bigger each year and we hope to keep that trend going. It is a great chance to meet mates and enjoy a pleasant meal. We will also hear from the CO on the state of the Regiment. Please get out and ask your colleagues to attend. An advertisement for the AGM is enclosed in this newsletter. I wish you all well and look forward to your attendance at the AGM. My first four months seem to have flown since I arrived. The Regiment was in an excellent condition thanks to my predecessor, LTCOL Nan Bahr. While there was a significant changeover of senior staff in the Regiment, I have been impressed by their dedication and effort to getting on with the job. The year commenced with the Graduation of 17 Staff Cadets at RMC in late February. The Honorary Colonel, MAJGEN John Pearn was able to attend and watch the magnificent parade and the presentation of commissions. We were fortunate in that 2LT Michelle Scott (NQC) was awarded the Geddes Military Skills Prize for the Most Outstanding performance in Military Skills. The graduation was followed by a Graduation Cocktail Party at the Regiment's Officers' Mess where the newly promoted 2LT were able to meet their new Commanding Officers, and allowed QUR to farewell the graduates in style. Our next challenge was the Specialist Officer Course, held at Amberley RAAF Base, due to the lack of facilities at Enoggerra and St Lucia. 28 specialists arrived bright and bushy tailed, and over the next two and a half weeks, all 28 students developed into officers able to understand and participate in service life within the Army Reserve. My thanks go to the Senior Instructor, MAJ Kerry Tscherepko, and Course Managers CAPT Andy McCarthy and WO2 Kerry McGreevy for their outstanding efforts in the conduct of the course. The Regiment also commemorated ANZAC Day with a parade through Toowong to the Toowong Memorial Park where the ANZAC Day service was held. It was a stirring ceremony, with CAPT Scott Fisher delivering a wonderful speech on the relevance of ANZAC Day to today's society. Personally it was wonderful to see the younger generation attending the service and I am sure that ANZAC Day will continue to mean much to our youth of today, through the military traditions fostered through the Regiment. My thanks goes to the RSM, WO1 John Davidson, for the excellent drill and smooth conduct of the parade and service. At the conclusion of the service, a gunfire breakfast was served at Witton Barracks and included a hearty breakfast prepared by the Caterer, WO2 Graham Smith and his staff. Two-Up, Crown and Anchor and numerous meat raffles kept the visitors interested for the morning. MAJ Rob Sawford, OC Training Support Company and his staff did a wonderful job in organising the day. The Regiment's Birthday was celebrated on 8 May by a Tuesday evening parade with the youngest member, SCDT Jon Cawcutt cutting the cake with myself, and MAJGEN Pearn was able to attend for the celebrations. The Officers also celebrated with the Annual Regimental Dinner, held at Cromwell College and attended by the Governor of Qld, Her Excellency Ms Quentin Bryce and Dr John Herron. Dr Herron, a previous RMO of QUR, gave a wonderful after dinner speech of his life within the services and in particular his time spent with the Regiment. It was wonderful to see so many previous graduates, Commanding Officers and Honorary Colonels at the dinner. We look forward to the Regiment's 60th birthday celebrations next year. As I write, we have just commenced the final Mod IIIA1 course at Amberley. 94 staff cadets arrived on Friday evening to complete the course at Amberley for the period 30 June till 15 July. Mod IIIA2 will follow consecutively from 16 July till 1 August. MAJ Rob Brennan, OC Trg Coy is the SI for the two courses and has been well supported by all companies of QUR as well as from AUR and MUR. I'm sure that the course will be as successful as the SSO course. 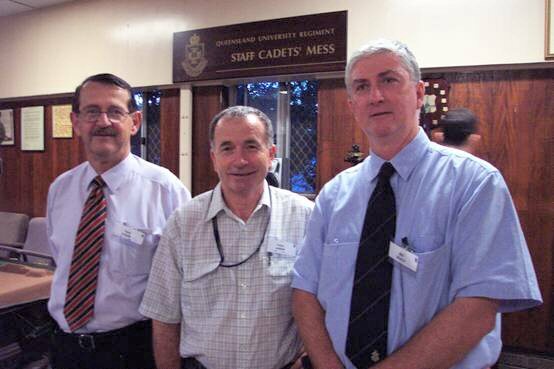 Project Hamel, which is the revised ARes GSO First Appointment Course will commence in January 2008. The aim of the revised course is to "deliver LT who can deploy on peace and stability operations". It will consist of 5 modules of 104 days continuous training, as well as non-continuous training on weekends and Tuesday evenings. The Staff Cadets will commence at Module 1 and consecutively complete the courses until the graduation course - Module 5 at RMC. 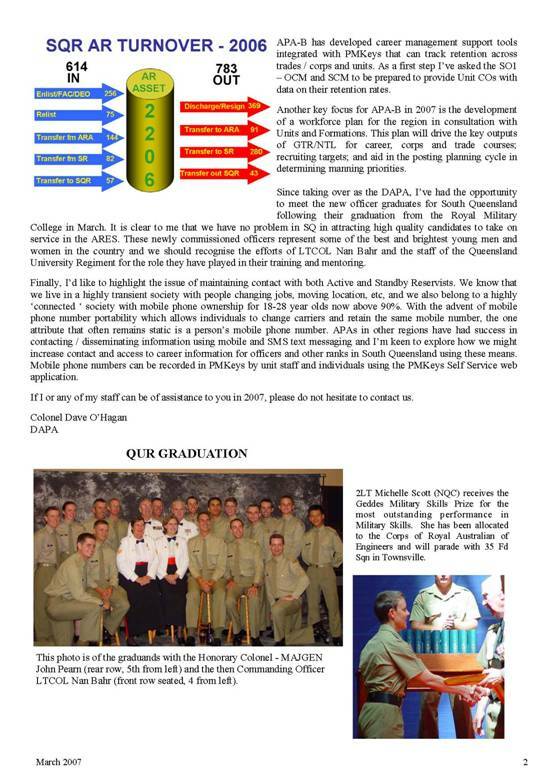 Module 5 will be offered in February and July annually, which enable the cadets to graduate at two opportunities in the year, which is a real bonus for both the cadets in the FAC construct. Finally, for anyone who has visited the Regiment premises recently, you will see that the Regiment is decanted into demountable buildings for the period of refurbishment by the removal of asbestos within the walls of the old buildings, both at St Lucia and Indooroopilly. Although the next few months will be disrupted, the Regiment will continue with its high quality instruction and provision of services until we return to a fresher building. My thanks go to all staff and cadets for their patience during this period. Lieutenant Colonel Jenny Cotton was born in Queensland in 1959 and was educated in Brisbane. She graduated from Officer Cadet Training Unit (SEQLD) in August 1983 and was commissioned into the Royal Australian Corps of Transport (Army Reserve). As a Lieutenant she served with the 1st Training Group and 1st Movement Control Unit before transferring to the regular army and serving at Headquarters 2nd Military District, Sydney and Liverpool Movement Control Offices. As a Captain she served with the Liverpool Movement and Transport Unit, Army School of Transport and 5th Aviation Regiment. In the rank of Major she served with Headquarters 1st Joint Movement Group as the Staff Officer Plans and Operations. 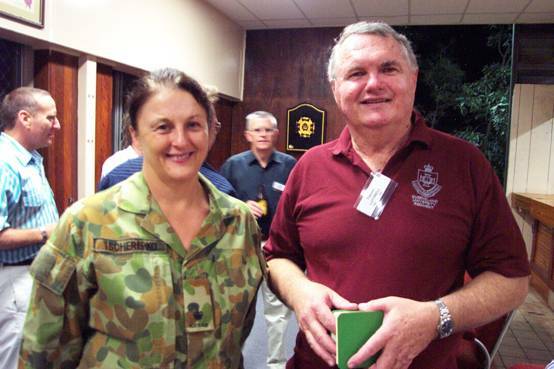 In 1997, she transferred from the regular forces to the Army Reserve and has served with the Army Personnel Agency Brisbane as a Career Adviser (Services). In December 2000, Major Cotton deployed to Bougainville for 4 months as part of the Peace Monitoring Group where she was employed as the Senior Logistics Officer at Loloho. On her return to Australia, she was posted to 7th Command Support Regiment as the Officer Commanding, Combat Support Services Squadron. She was posted to the Second In Command of the 7th Command Support Regiment in January 2003 and acted as the Commanding Officer from September until December 2004. 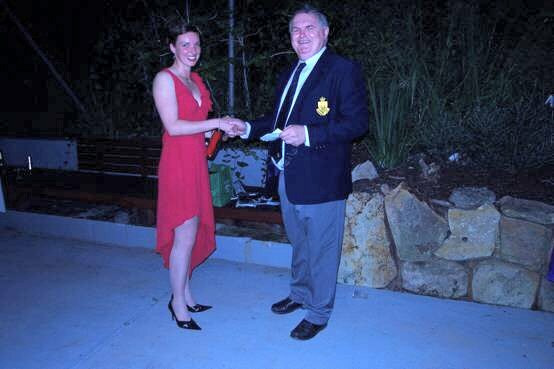 She has attended Australian Command and Staff College (Reserve) from August 2003 until graduation in December 2004. She was promoted in November 2004 and posted as the Liaison Officer, J1/4 Branch, Deployable Joint Force Headquarters. 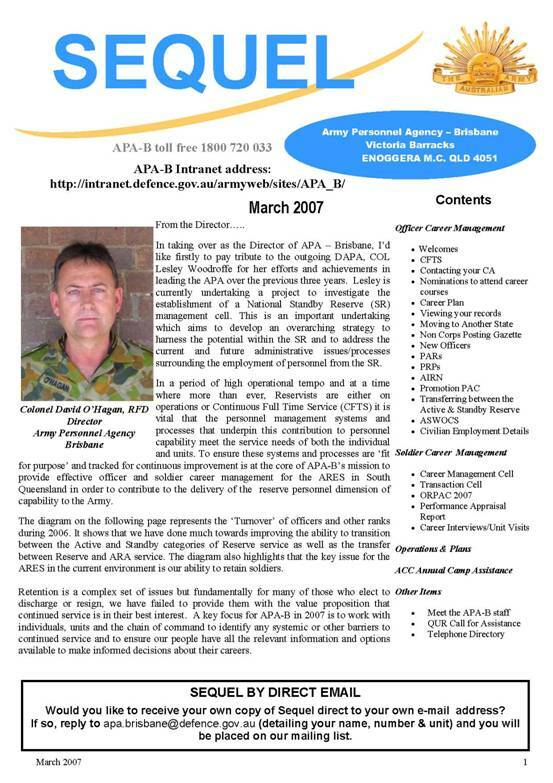 Lieutenant Colonel Cotton has a Bachelor of Human Movement Studies (Education) from the University of Queensland, a Graduate Certificate in Transport Systems Management and a Master of Business Administration (Executive) from the University of Queensland. Lieutenant Colonel Cotton is divorced and has three children, Thomas 15 years, Simon 14 years and Madeline nine years old. In her civilian job, she is employed full time by the Australian Bureau of Statistics as the Assistant Director, Corporate Services of the Queensland Office. 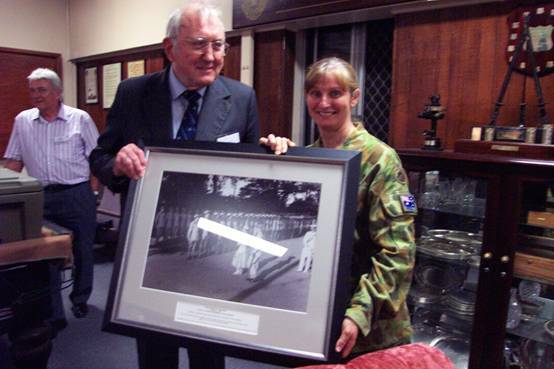 At the recent Back to the Regiment function John Greenwood presented a large framed photograph to the Commanding Officer QUR Jennifer Cotton. The picture showed the Royal Guard on parade at Government House in Brisbane on 3rd March 1954. The guard for the Royal visit of the Queen and The Duke of Edinburgh was made from members of the 9th Battalion, The Moreton Regiment and Queensland University Regiment. This was the only time when the CMF mounted a guard in Australia for the Royal visit. The snapshot was taken just as her Majesty approached the right marker of the guard. It is important to note that John Greenwood was that right marker. During the presentation John Greenwood related some of his memories from that occasion. With John’s permission here is a summary of some of his memories. John said that all the members of the guard had a common goal… they aimed not at excellence but for perfection. To ensure that the highly starched trousers were not creased they stood on tables to get into their trousers. When being transported by bus to Government House they did not sit down but chose to stand in case they would crease their uniforms. John said that he knew that Her Majesty would not stop and talk to the right marker during the inspection. Her Majesty would normally stop about 4 or 5 members along the front rank. However, John knew that when Her Majesty stopped the Duke of Edinburgh would stop and talk to the right marker. John also knew that he should not drop his eyes to look at Her Majesty when she passed him, and he was aware that the Duke of Edinburgh would watch him closely in case he did that. The Duke would then not talk to the right marker. So John had a decision….. drop his eyes and look at Her Majesty ( John is a rather tall man ) or look to the front and hope the Duke would stop and chat. John relates that he chose to look at Her Majesty as she passed. On the march off from the parade ground the guard passed some very old Boer War veterans standing by the side of the road. As guard marched by the veterans rose to their feet, stood to attention, but they were crying. John relates that the band was playing “Soldiers of the Queen” John was moved by this display of patriotism. The picture will be hung at the Regiment as another piece of QUR history. 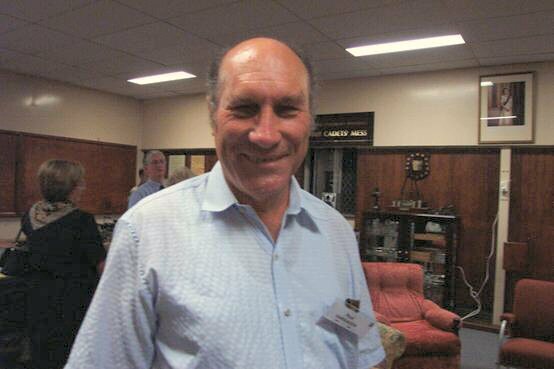 We were saddened by the news that Peter Charlton passed away in May of this year. 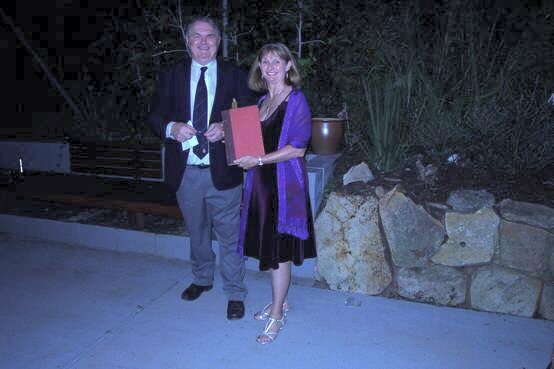 Peter was well known in Queensland as a prolific author and journalist. Peter was born in Newcastle and attended University in New South Wales. He worked in the Queensland Treasury, the Brisbane Telegraph and the Courier Mail. 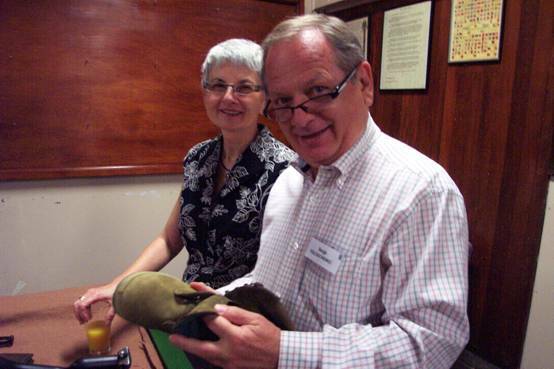 In 1981 he published his first book "The Thirty Niners", a story of those who enlisted in the AIF in 1939. His father was one of the members of the 39th Battalion. Peter also wrote several other books about World War 11. Peter served in QUR as a company commander and went on to command the 49th Battalion, The Royal Queensland Regiment in the early years of the changes brought about by the “Ready Reserve”. One of his books in the political scene was “State of Mind” which looked at the style of government in Queensland in 1983. 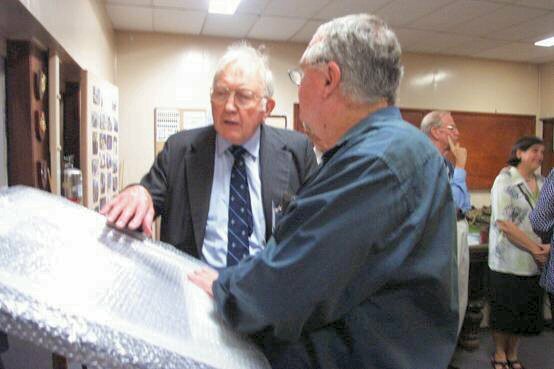 David Fagan, Editor, Courier Mail, said “Peter’s insight has been central to the Courier Mail’s coverage of many big stories of the past quarter of a century. The intellect and insight he has applied has made our readers better informed. Peter and his work will be greatly missed. Peter is survived by two children, Nick and Sam. reproduced here to help members keep in touch with member's whereabouts and circumstances. Late of Glebe, Sydney. Formerly of Brisbane and Newcastle. Respected Journalist and War Historian. Beloved son of Mavis and Allan Charlton (both dec) of Hamilton, Newcastle. Father of Nick and Sam. Grandfather of Phillip and Mateo and Alexander. Brother of Phil and Bev. 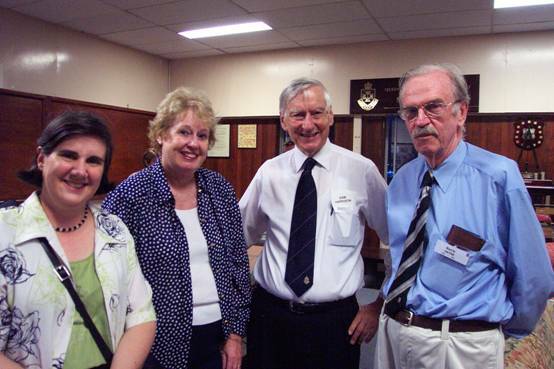 Family, friends and colleagues are warmly invited to attend Peter's farewell, on Thursday, (May 24, 2007), at Macquarie Park Cemetry and Crematorium, Camellia Chapel, corner of Delhi and Plassey Roads, North Ryde, Sydney, commencing at 11.30am. The photo of me sanding is the one I have never seen. Thanks for the latest QURA Newsletter. It is good to catch up with you all via this means. 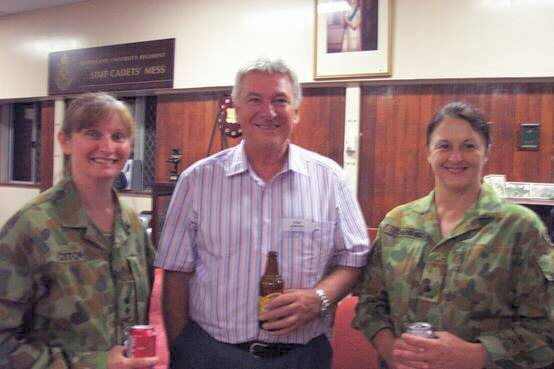 For an update, I have stood down as the Principal Chaplain – Army from 21 January 2007 and am now on Long Service Leave until the middle of the year when the plan is to transfer from the ARA to the Active Reserve and continue as the Reserve Anglican member of the Principal Chaplains’ Committee, that should be 5 to 6 years (God willing). At this time Sandy and I have no idea what civilian church employment is ahead of us. I will begin to negotiate with Bishops after Easter. Until then we have set aside the early months of 2007 as a time of deliberate re-creation and rest. I will keep you and the Association advised of any change of address etc when the time comes. For your records, in the Australia Day Honours I was made a member of the Order of Australia (AM) not an OAM as stated in the Newsletter. I've moved down south and currently reside near Tamworth in a little town called Manilla. I won't be able to make Back to the Regiment. My husband, Bill Gwynne, has been in hospital for about three months. He went in for a disc operation, which was elective surgery, but then more serious complications arose and he also picked up a staph infection. I have delayed replying because nobody knew how long he would be in hospital. Bill has now been transferred to a rehab. hospital, so hopefully it won't be too long before he is fully mobile again and able to come to a QUR function! 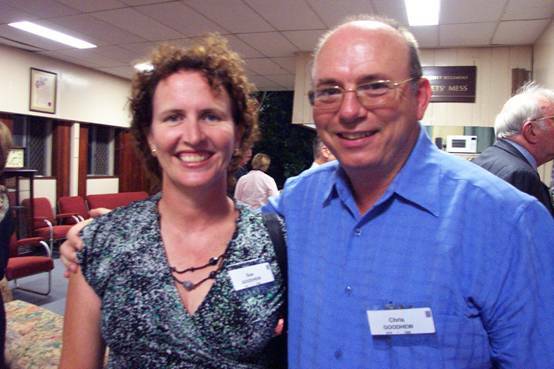 Peter I may not have told you, Leonie was diagnosed with inoperable liver cancer on Christmas day. I will not be attending any functions for the forseeable future. The" broken colours case" brought back many memories. However the then a/adjt must have still been concussed. We were at Tin Can Bay I think. I can vividly remember the lacerations on the adjt and the a/adjt's face but time seem to have erased his/ her features??. I know we replaced the glass with a more fool proof plastic sheet - Trevor Lutterell can probably remember the details. 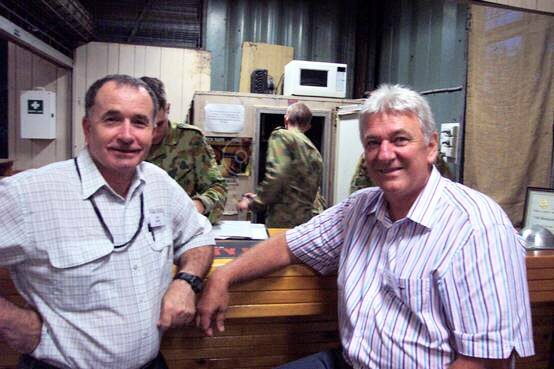 You might also remind Trevor of the same camp when he, and others, while fiddling illegally with the depot electricity in the ceiling trying to wire the colours cabinet set off just about every alarm between the depot and Canberra!! I would be very happy to write something, but it would need to be for a later newsletter. After 4 months continuous travel, I am just finalizing some matters here in Bangkok before returning to DC this week. So let me get back to you on this. Once back in DC let me also follow up on the membership. 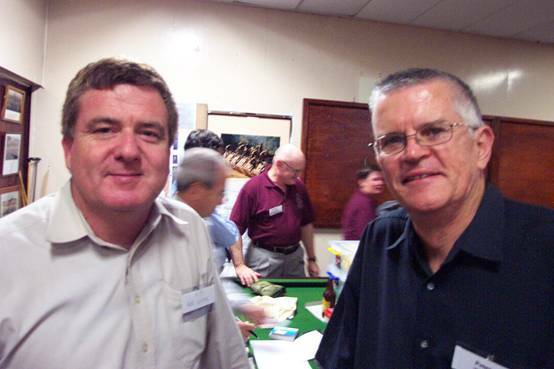 The website provides a very nice archive of newsletters here which I have now scanned through, some of which conveyed the sad news of the passing of Garry Chandler, Pete Rayner and Shane Slipias. The various pics are indeed a trip down memory lane, in the 21 years since I had contact with QUR. Full credit to QURA, that it would seem to have the best website for information. None of the other units, with which I served after QUR, would seemed to be so well organized. As discussed on the phone last week, this email is to confirm that Len is the new Bishop to the ADF. His consecration was in the ANZAC Memorial Chapel of St Paul, Duntroon, on 29 June. War is the product of an earlier corruption and a producer of new corruption. It is a sign of a soldier to believe that there is nothing left of man after death except a corpse. The wings of man’s life are plumed with the feathers of death. Who shows mercy to an enemy, denies it to himself. As many are soldiers that are not captains, so many are captains that are not soldiers. Force, and fraud, are in war the two cardinal virtues. A day of battle is a day of harvest for the Devil. The cause of some going to war, and of others avoiding it, is the same desire in both, attended with different views. them. It can have almost no other purpose. Today, violence is the rhetoric of the period. All a soldier needs to know is how to shoot and salute. The legitimate object of ay is a more perfect peace. 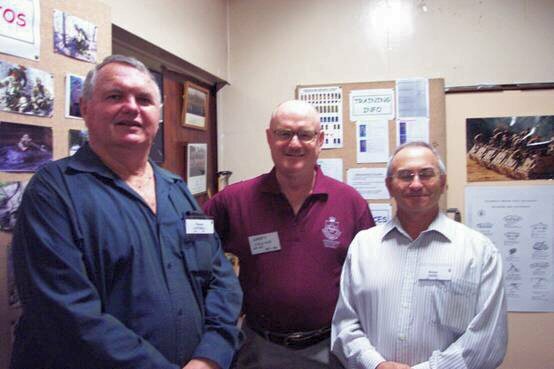 Association members and their partners and guests attended the Standfast Club, the soldiers’ club at the Regiment’s St Lucia depot, for an evening of good cheer with old comrades and new acquaintances from amongst the membership and those currently serving in QUR. Like most people who have ever completed a recruit course, initially I hated the army. After all, what’s to like? Entering a camp of strangers a normal human being only to emerge, sixteen days, with self esteem thinner than paper. It’s a well developed psychological technique – tearing people down in order to build them anew to suit the model. But it does form strong bonds with your fellow sufferers, and there were some great girls on that course also from QUR - Joanne Gliddon, Jeanette McGavin, Jacinta Long, Narelle Clarke, and Madeleine Knights. FRONT ROW: (left to right) Rec. A. Jackson-Carroll, Cpl. L. Kilworth, Cpl. D. McEwan, W.O.2 R. Cattle, Sgt. P. White, Cpl. G. Currie, Cpl. A. Wright, Rec. J. Taylor. FOURTH ROW: Rec. C. Preedy, Rec. P. Edhouse, Rec. M. Mobbs, Rec. L. Bliss, Rec. R. Storch, Rec. L. Martin-Chew, Rec. G. Behan, Rec. J. Townsend, Rec. J. Cappiello, Rec. D. Grogan, Rec. J. Gliddon, Rec. J. Day, Rec. A. Whittaker, Rec. C. Magnani. 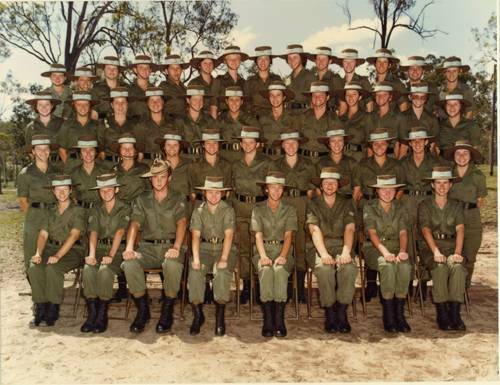 I think that recruit course was at Wacol in November/ December 1980. After that it was a huge relief to do a camp with QUR. There was still abuse from those with authority, and plenty of rank, saluting and marching, but there were also ambushes, a five day bush trek, orienteering, exercises and fun to be had. Most of us were at university and the culture felt completely different to that I’d experienced at Wacol. At the time QUR was actively recruiting more girls, and for the first time female soldiers were required to do A Company Infantry Training. We’d been warned to build our fitness, and in January 1981 we did a sixteen day exercise at Tin Can Bay, where the hard work was matched by the level of play. We spent five days marching in the bush, woken in the middle of the night to patrol and march some kilometres in darkness and silence before establishing camp again, dug latrines, lived on ration packs and went without a shower. We were shot at, ambushed, spent hours patrolling at snail’s pace and in silence (sort of) through the heat of the Australian bush in summer. We got hopelessly lost in our orienteering exercise in the few moments that I had the compass. The sleep deprivation and sense of being stalked provided a faint glimmer of what it might be like to be at war for real with those now disregarded methods. It was on one of those camps that we learnt to shoot and look after our SLR, but also to operate a sub machine gun. My first shot with the rifle was my best. I never learnt not to dodge the kickback and from then on every shot went awry. Days at Tin Can Bay would comprise a morning working hard and often an afternoon at the beach, after bumping over kilometres of bush tracks to the sea. We explored the beaches and mangroves, swam, ate and drank (no doubt). Rank was forgotten. I remember burying one of our captains in the sand. He also gave me an impromptu driving lesson in one of the army jeeps one day when we were out and about on the sand tracks. It was an excuse to become a little familiar for this otherwise mild-mannered (and married) man. The rebuff was fully expected, but he seemed to feel almost obliged to try it on. Like many others who were accustomed to camps with few women, suddenly there were barracks-full of young female soldiers, and most nights would be punctuated by some sort of abrupt entry or exit of a male officer in or out of the windows of the female barracks. 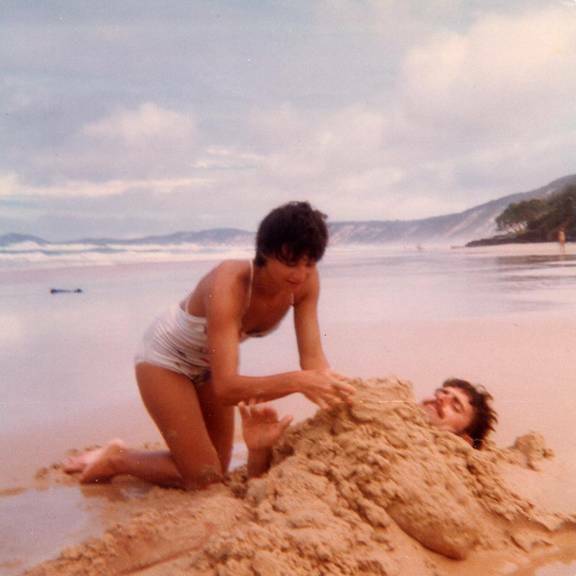 On the beach is Private Narelle Clarke and an unknown(??) officer. I still have the “Best Female Soldier A Coy” plaque awarded to me on the last evening of that camp of January 1981. No matter where I’ve lived somehow it usually ends up in my top drawer. And many a time I’ve entertained my colleagues and friends from the arts with highly coloured accounts of my days as a “trained killer”. It’s the active soldier stuff that is most memorable. I was uplifted from the ground on a rope and reeled in to a helicopter hovering overhead. Often we moved in formation as a platoon, laden with packs, onto a helicopter which would be on the ground only for a matter of seconds, rotor thundering above. Then there were trips in Chinooks, Hercules aircraft, and lots of chopper rides. After A Company, being more of a Private Benjamin than officer material, I became B Company clerk. I liked the job, and worked Tuesday nights, some weekends and most camps, until 1984 when I had three other part time jobs and something had to go. Apart from the clerical work, I cut diggers hair (in clueless fashion), spent time in the bush with the company, and watched the young faces front up for their advanced infantry training over three or four years. After work Tuesday nights there would be drinks in the mess and sometimes we’d go in search of coffee. This was harder than you’d think given that in Brisbane in the early 1980s the only places open after 9 pm were the Snuggle Inn in Milton and the Cubana in the CBD. I remember great parties (courtesy of Michael van Baarle) at Government House when he was Aide de Camp to the Governor, and others in student flats and houses. There were countless nights at the Orient Hotel with “Rusty and the Ayers Rockettes”. I’d had such good friends from the QUR orbit but lost touch with everyone after I moved to Sydney in 1986, although I think Michael van Baarle remained on my referee list for years. It was curious to go “Back to the Regiment” in March, held in what was the OR’s mess. The current batch of soldiers was charming, deferential and respectful to us old boys (and girls). It felt completely bizarre because truly it doesn’t seem that long ago that I was there myself. This is a day of reflection – of remembrance – of respect – and of renewal. Distinguished guests, Ladies and Gentlemen, I very much appreciate this opportunity to speak to you on this important day in our national calendar year. It is heartening to see the increasing number of people, especially our younger generations, attending these dawn services. I know the ever decreasing ranks of our veteran's value your attendance. Today is a special day when we remember all those, whether service personnel or civilians, who have served our nation, who suffered or continue to suffer through war, conflict or crisis, especially to reflect upon the selfless sacrifice of those who died and were wounded to preserve our freedom and independence. In particular we remember those who served in the Australian defence forces on active service from the Boer War to Afghanistan and Iraq, including those currently serving with the UN and other peacekeeping missions in East Timor and the Solomon Islands. We remember those who paid the supreme sacrifice so that we, and the people of other nations, can live in peace. We remember those who continue to suffer through their physical or mental scars, including those next of kin whose grief and sense of loss can never be eased. This is also a day of thanks and quiet reflection on what a wonderful, lucky nation we live in. It is a time to reflect on Australia's commitment to continue to contribute to peace in other parts of the world. We cannot isolate ourselves and ignore these responsibilities. In a perfect world there would be no wars, no aggression and no requirement to maintain defence forces. Unfortunately this is not a perfect world and there are more areas of conflict than ever before. Where necessary, to preserve the peace in our region or elsewhere in the world, we must be prepared to deploy our forces, such as these young men and women in front of you today, to fight for or protect the rights of our neighbours and our own nation. Some say this day glorifies war, but every veteran will be the first to say that their greatest wish and most fervent prayer is that their children and this nation may never have to witness the horrors of war again. As the ranks of our veterans continue to diminish, let us be determined to maintain this special day so that we can take a break from the roller coaster of life to reflect on how fortunate we are, to reflect on our freedom. To recognise the futility of war but to acknowledge that we must be prepared to defend this freedom. The ANZACs, and the more than one hundred thousand servicemen and women who lost their lives since, would be the last people to ever glorify war or their part in it. Their greatest gift to us, through their suffering and that of their families, is our freedom and the opportunities we are now fortunate to enjoy here in Australia. So let us, all of us here at the Toowong Memorial Today, strive to be worthy of those we honour on this ANZAC Day. We can show our appreciation not just through remembering them, but by committing ourselves to follow their example. Let us face challenges together, let us strive to maintain future freedom and be willing to shape a better world. Not many of us are called upon to place our lives in danger for others. We admire those who do. For all of us here today, we can reflect the spirit of ANZAC through our behaviour towards one another – be this a commitment to a mate in need, a desire to care for others less fortunate than ourselves or in need of help, or simply by being more tolerant, more considerate, more generous and understanding. On behalf of all the men and women in the Queensland University Regiment, let us remember all the young Australians who sacrificed the pleasure of growing old with their families, children and friends, who created the traditions we value so highly and which underpin our ethos of service to our country. The Annual General Meeting for the QUR Association will be held at the United Service Club, Wickham Terrace, Brisbane on the evening of Friday 14 September 2007 at 1900 for 1930 hours. The cost of the AGM will be $80.00 which includes pre-dinner drinks and a three course meal including wine and port. The guest speaker will be Richard Palk (Circa 1970s) talking about life and his memories of QUR. 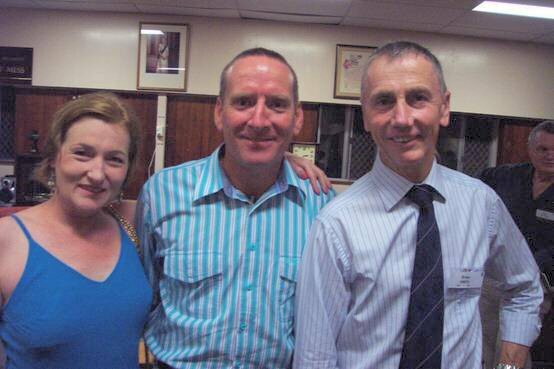 Richard has returned recently from Malta where he was High Commissioner, Australian High Commission. QUR Co LtCol jenny Cotton will also give a `heads up` on what is currently happening with QUR. EMAIL reply to the membership Registrar (Peter Morton ). I will be attending the Association’s Annual General Meeting Dinner to be held at the United Service Club, Wickham Terrace, Brisbane on the evening of Friday 14 September 2007 at 1900 for 1930 hours. I understand that from 11 September 2007 should I later find that I cannot attend, I will be liable to pay for the function. I regret that I am unable to attend. Please tender my apology. For members with internet banking, a payment of $80.00 may be made direct to the QURA Bank Account. Details are BSB 064 129, Account 0090 4500, Account Name QUR Association Inc. Please ensure your name is supplied in the payment details. If you wish to pay by cash or cheque, please pay on the night.